I am in process of trying to buy my first canoe, I have recently begun tripping, I am starting to go more, and want to do many more trips, but the rental costs are quickly adding up. I found Killarney Outfitters Used Canoe page, since I don't know very much on used canoes/when it's a good deal, hopefully some of you can help! -Has anyone bought from Killarney before? -Whats the main difference between a Quetico vs Prospector design? -Is buying from an outfitter a bad idea? -Any insight on the condition of these versus the ~$2,000 price point? I mainly do Algonquin lakes, I do not shy away from portages, may do a bit of rivers in the future. Usually tandem, but would like to solo in the future, so maybe a 16' Prospector is best? We don't pack too much gear usually. Killarney is 4.5 hours from me in Toronto, so if I do buy one of these, I want to know what I am looking for before I waste 9 hours of driving! You might be able to get a better deal with Algonquin Outfitters' used canoes... check out the Swift Algonquin at $1500 in expedition kevlar... stable, durable and good for tripping, load range 350-600 pounds. Symmetrical design, so can be paddled reversed going solo, with gear packed up front. Their Kipawas will be less stable but higher performance and asymmetrical so soloing's done with a kneeling thwart since paddling reversed isn't recommended. Smaller with a load range 330-575 pounds. I didn't see any in expedition kevlar, so less durable. Once canoe season starts, these will probably sell out fast... you might be able to buy early with the condition to test-paddle (the Kipawa might be too small and unstable with the Algonquin likely the safer bet). Souris River builds tough canoes and there are many trippers that have been pleased with their Quetico's stability and load-carrying capacity. Not sure about the SR Prospectors but the Quetico is asymmetrical so shouldn't be paddled reversed like the Prospector can be. KO's prices seem high at over $2K but maybe condition is better... someone here reported some problems with their used canoes in the past but I really can't recall what that was about... good luck. To clarify: Souris River Quetico is definitely symmetrical. I've soloed all three 16, 17 and the 18.5 Quetico. I own the 18.5' Quetico (bought new in 2010). My buddy bought a 17.5' Quetico from Killarney Outfitters in 2015, it was in great shape and no issues. I paddled the 16.5 Quetico on two trips. The 18.5 Quetico is actually not hard to solo by sitting in the third seat. The 17.5 Quetico is harder to solo because one of the thwarts goes across just behind the front seat - gets in the way when sitting backwards. The 16 Quetico is a good tandem for solo (as far as tandems go), and really nice as a tandem. Quetico 16 is great for 1-2 people. The 17 is good for 2 grown-ups with 2 kids. For the 18.5 Quetico, it's been great up to 10 day trips with 2 adults, 3 kids and a dog. I prefer the durability that results from the epoxy process of Souris River (and H2O Canoes) compared with the gel coat manufacturing of the Swift's. If I was buying a rental canoe, I'd go with a Souris River. I have a Q-17 that was from Killarney Kanoes fleet. A workhorse to be sure. Definitely symmetrical with a flat bottom and very little rocker. Initial stability is high, but final stability is not (read into that what you will). Responsive to paddle solo empty on a mill pond, but more than a handful to solo in the wind. Confidence inspiring heading directly into the wind and waves (tandem), but with its flat bottom, it's very un-nerving in quartering and broadside seas. I once had to take a heading crossing West Bay on Smoke Lake from the south in a heavy west wind that put me 700m and an extra 20 minutes hard paddling upwind from our travelmates paddling a prospector who were able to take a direct line across the mouth of the bay. I spoke to the folks at Souris River about those bow thwarts and they indicated to me that they were installed for extra durability on rental boats, but for personal use, can be removed as the riveted seats provide plenty of structural strength on their own. IIRC, Swift canoes also come in skin coat without gelcoat too, but they use vinyl-ester or polyester resin in their layups rather than epoxy (which I also prefer). I'm a fan of S.R. canoes, but with time, less enthralled with the Q design. I'm looking to parlay my Q-17 into an S.R. 17' Prospector (shallow arch/more heavily rockered) ... or even better, (though a different design)a Guelph made Bluewater Freedom Explorer 17.9 in Golden Brawn. In closing, Killarney Outfitters seems to do a good job of refurbing their used canoes for resale. I think you can be assured of a solid boat from them, though if you are patient and can act fast, there are better private deals to be found on kijiji. or even better, (though a different design)a Guelph made Bluewater Freedom Explorer 17.9 in Golden Brawn. I believe 2001 was the last year that Bluewater was made in Guelph. It was then moved to New Liskard, now knows as Temiskaming Shores to the Mid-Canada Fiberglass plant where Scott canoes were made. I think they closed in 2013. Those two brands of canoe are now shown on the Abitibi website showing Rouyn-Noranda, QC as their current address. OSU... yeah, the partially flat bottom on the Quetico and the effects on secondary stability would make me think again about going solo in it, esp in waves. Having been stuck paddling a flat-bottomed canoe in the past, I'm not going back to that. Bluewater/Abitibi's Freedom 17 has been reported by some as being great to paddle solo or tandem and durable, I'd try it. IIRC, some of the criticism of SR canoes relates to their flex-rib construction being too flexible and causing some oilcanning which degrades performance. The Quetico's flat bottom might make that worse vs the arch-hulled Prospector. The flex is great for durability when it comes to absorbing shocks and maybe better for bashing around on rough trips. There may be some deals on used canoes up for sale at the start of the season on Kijiji, also the Buffalo and Rochester Craigslists for those with a passport for cross-border trips. Thanks for the discussion everyone, definitely helps. I think I'll wait for spring to come before I purchase, it is exciting to shop for though and hard to wait! I have Kijiji notifications set up, didn't realize people still used Craigslist, I'll have to check that out, though not in the States. Thanks Dave. I've been following Bluewater's evolution and actually I missed an Explorer when MCF went into receivership. Having said that, I'm more interested in finding a pre-loved boat than new ... and though I have no hard evidence to support this, my gut tells me the build quality was best before New Liskeard or Quebec. @frozentripper. Tx for the input. I believe that the knock against the flex rib system comes from competitors slagging a design that corners a large market share of outfitter boats that they'd like to have a bigger piece of. From experience with my canoe, I'd say those ribs would have to take a whole lot of abuse before they fatigued enough to oilcan. Rentals do take more knocking about than personal canoes, so certainly something to check for in a used S.R. But to the OP's question. The Q-17 is a great canoe, albeit with limitations. If I had no choice, I would not hesitate getting another. But if there were a Q-17 beside an S.R. Prospector, at the same price, I would chose the prospector. @Yates. I checked the Portage Store's S.R. sell off a few Mays ago. Theirs were in the $1000-$1300 range but were as is, oh so tired and required fix-em-ups at home. Killarney Outfitters' boats are refurbished and ready for years of enjoyment, albeit spendier. Oh, and as for the kijiji alerts ... I would still do several searches a day. The best buys are snapped up quickly and the alerts may not arrive until the morning after the canoe has been posted. Good discussion and I think you've made a wise choice. While i can't offer any specific information on the Souris models you're looking at, I do note that they'll be at the Toronto Outdoor Adventure Show at International Centre Feb 24-27 and you'll be able to paddle any of their models there. And as noted Swift will also let you test paddle their canoes at any of their locations including the Waubashene store on Hwy 400 ( a little closer to TO than Algonquin). Regardless of the model and make you select I'd strongly suggest that you spend the time- even if its a 9 hour round trip!- to look at any used canoe carefully in person. Or get someone you know and trust to do it in your stead. Rental canoes can take a real beating and you want to make sure that saving a few bucks up front doesn't end up costing you much more down the road. Pook - I agree, I realized that I went to go see a canoe and it was worse in person than on the pictures. Seat was lifting up, puncture repairs, etc. SR won't bring their used canoes to that Toronto show right, so I would be just testing the two versions to know which to buy right? The Voyageur Outfitters got back to me that they'd be selling in the Spring for ~$850, I realize now that they will probably be as-is as well. At a high level, a SR refurbed canoe is 800-1200 more than AO ~1300 canoes or Voyageurs ~$850 canoes. Is that much extra money really worth the 'refurbished'? How much work does SR do to refurb a canoe? How much work do the outfitters do on a boat year over year to keep them rent-able? I really think your last question will depend greatly on the Outfitter AND the specific canoe. But in my experience the asking price is usually reflective of the amount of abuse/ wear and tear they've seen. Figure out the canoe models that fit your need. And then start looking around. There are lots of used canoes in great shape out there- and not all from outfitters. 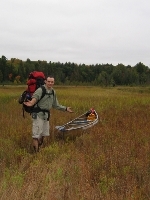 Check out MEC Gear swap, Kijiji, canoetripping.net and this website. The Complete Paddler just off the QEW usually has a number of used canoes in there as part of their rental fleet or on consignment. Hope that was somewhat useful. Hi Yates - The folks here are great with advice (I lurked a long time before joining up...). Another place to check is Frontenac Outfitters, which sells off their rental canoes annually as well: https://frontenac-outfitters.com/rental-canoes-for-sale/. They are in the Kingston area, so not too far from TO. They carry the H20 line. I've never paddled them, but I know people on the board have and seem very happy with their boats as well and the durability of their layups. I believe H20 uses epoxy as opposed to vinylester, which appears to be superior in terms of ease of maintenance (others can correct me if I'm wrong here...).